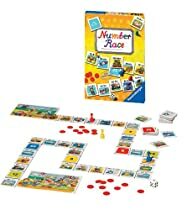 Ravensburger 24051 – Learn to add & subtract as you play! Roll the die & move your piece to that card where a calculation waits to be solved. The first level covers numbers 1-20 & the second covers 1-100. Self-correcting: answers on the backs of cards. Be the first to reach the goal & win. For 1 – 4 players. Play time: 30 minutes. Recommended for 6 years and up.